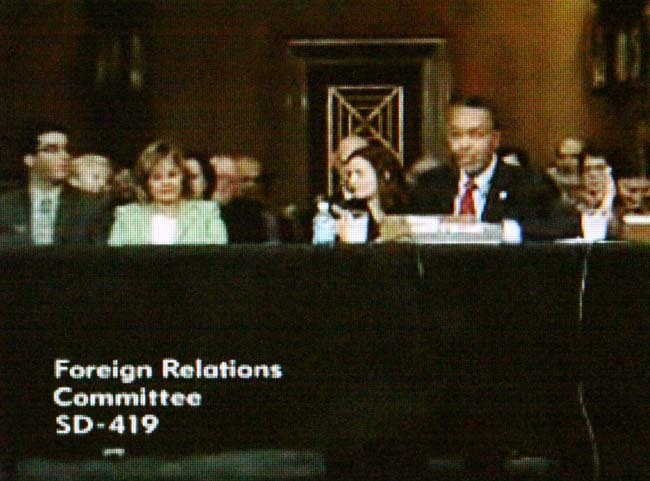 This is the third set of Confirmation Hearings for a Peace Corps Director that we have reported on and in many ways it was the most sedate and routine. It is obvious that Senator Dodd is intent on getting Aaron Williams confirmed as Director as soon as possible so that Williams can help convince Dodd's senate colleagues especially Senator Leahy of Vermont that the agency is in good hands so that when the budgets approved for the Peace Corps by the Senate and the House go to conference in the fall, the House's expansion budget of $450 million for FY 2010 will garner Senate support. Senator Dodd said at the close of the hearings that he hoped that the senate could move things along and get Williams confirmed before the August recess. 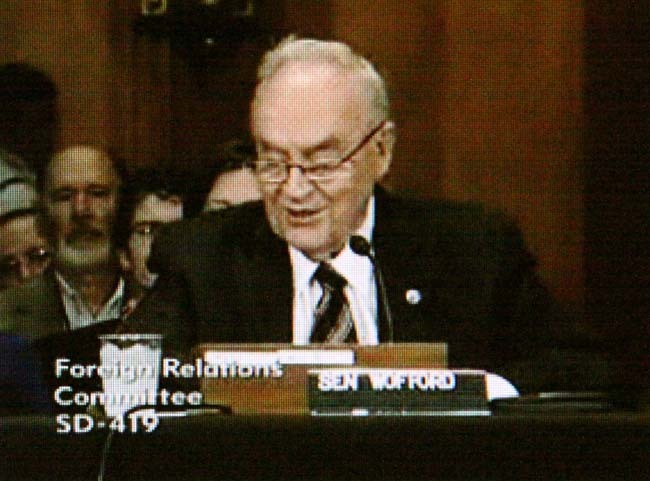 The hearings themselves were a veritable love-fest between Senator Dodd, Senator Isakson of Georgia (the ranking Republican member of the committee), former Senator Harris Wofford who introduced Williams, and Aaron Williams, the Director designee. 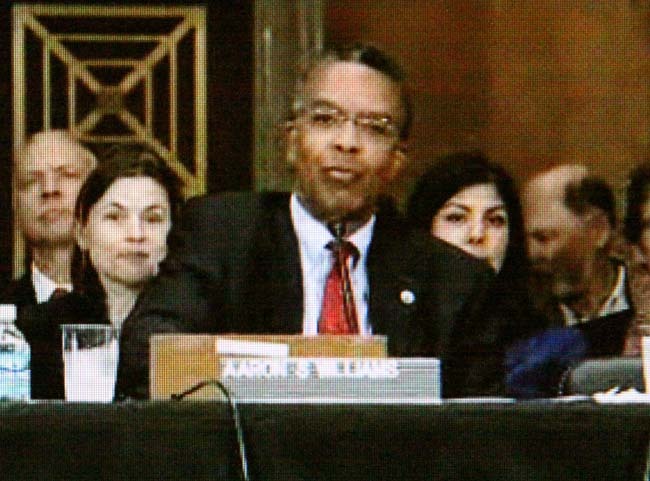 The hearings, which lasted a few minutes less than one hour, were long on generalities and good will, and short on specifics of how Williams intends to run the agency. Although a lot of issues were discussed, what was perhaps most important was what was left unsaid for although Harris Wofford mentioned a bold new Peace Corps and referred to President Obama's promise to double the Peace Corps, there was no mention by Williams about Obama's promise to increase the agency's budget. 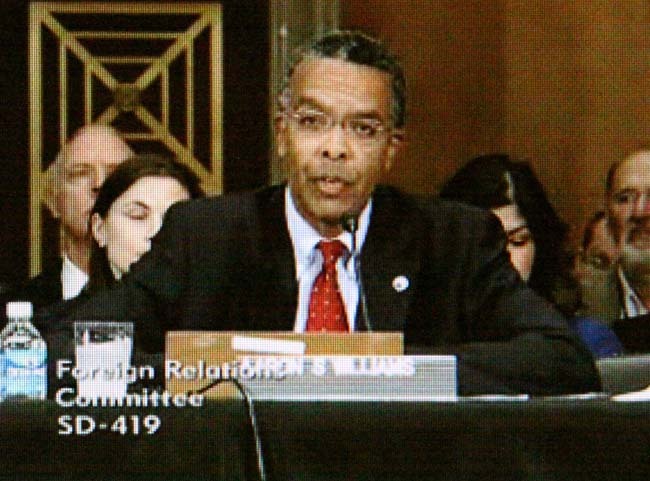 What is clear from the hearings is that Williams has the background and the skills to be one of the most effective Peace Corps Directors in the agency's history. The challenges are great - our best wishes and support to Mr Williams in meeting them. We have a couple of other observations regarding the hearings. Number one - we appreciate the interest that Senator Dodd is taking in Peace Corps. The Senator is a very busy man. He is the chairman of the Senate Banking Committee and with Ted Kennedy's illness, he is taking the lead on President Obama's Health Care Plan in the Senate, not to mention preparing for what is shaping up to be a very competitive race for re-election to the Senate next year. 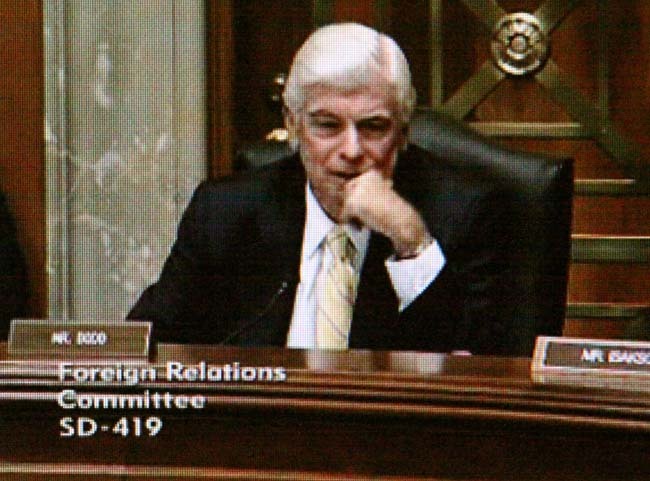 The fact the Senator Dodd is taking time out of his schedule to hold these hearings and to push to Williams confirmation before the August break shows the high regard with which Dodd holds the Peace Corps. Second, there were a couple of issues discussed in the hearings that were a little unsettling. One was the idea that one of the purposes of the Peace Corps is to bolster US foreign policy and that the State Department should take a large role in deciding which countries the Peace Corps should go into. That's not how the Peace Corps was originally set up. If you go back and look at the Peace Corps in the 1960s, it was set up to be independent of the State Department. "[Secretary of State] Dean Rusk has said repeatedly that Peace Corps volunteers are not a part of United States foreign policy," said Jack Vaughn in testimony before Congress in 1968. If the Peace Corps is seen as just another arm of US foreign policy, it can lose much of its effectiveness. Secretary of State Dean Rusk said it best: "To make the Peace Corps an instrument of foreign policy would be to rob it of its contributions to foreign policy." That was a problem last year when the US withdrew Peace Corps from Bolivia and the manner in which volunteers withdrew seemed to convey the message that the withdrawal was in retribution for the expulsion of Ambassador Goldberg. Another concern is Williams' many years working with USAID. The debate has raged for decades on whether the Peace Corps should work more closely with USAID and the consensus has been that Peace Corps is a people-to-people program - not a junior USAID. While we agree that the Peace Corps needs to have a collegial arrangement with other US government agencies like USAID, we would caution that Williams needs to be careful about applying the USAID model of foreign aid to the Peace Corps. One point that Williams mentioned in his remarks is putting more emphasis on the third goal. Both Senator Dodd and Senator Isakson said that little emphasis has been given to the third goal over the years and Williams agreed that the third goal "is a vital commitment for the Peace Corps family." We would urge Williams to look closely at his predecessor Ron Tschetter's idea for a "Peace Corps Foundation" and consider supporting the legislation that has been drafted to bring such a entity into being. A "Peace Corps Foundation" funded by foundations and non-governmental agencies could go a long way towards fostering third goal activities. Today, it stands at a crossroads of sorts. The things that have made the Peace Corps such a success story are still true. But there are difficult questions to be asked. How can volunteers be better managed? How can they be better trained? Are we focusing on the right kind of development work? Can we improve recruiting? Are we sending our volunteers to the right countries? Are the goals of the Peace Corps still in line with the goals of our 21st century foreign policy? The answers to these questions matter. That is why I introduced S.1382, the Peace Corps Improvement and Expansion Act of 2009. The Peace Corps, in my view, must grow. Today, the organization is faced with the prospect of having to reduce the number of volunteers when, instead, we should be planning to increase volunteers and expand operations to new countries like Vietnam, Indonesia, Egypt, and Brazil. At the same time, the bigger any organism grows, the slower it gets, and with growth must come reform. Good afternoon. 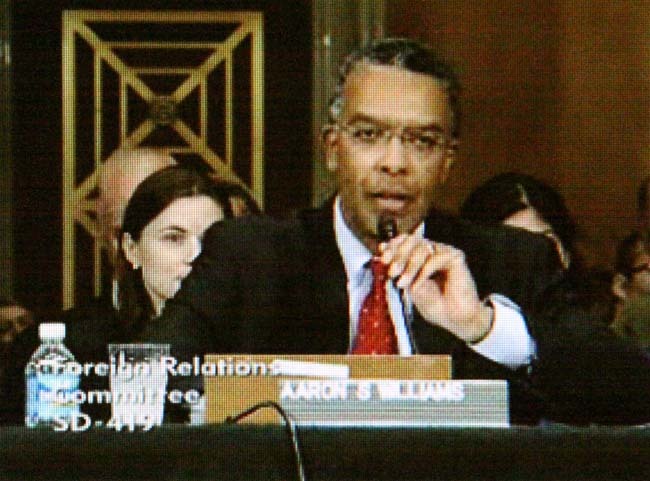 This subcommittee has convened today to consider the nomination of Aaron S. Williams to be Director of the Peace Corps. I'd like to start by congratulating Mr. Williams on his nomination. He and I have something in common. We both served in the Peace Corps at the same time, and in the same place � the Dominican Republic. Some of you may have heard me speak at some length about how valuable that experience was to me. My service there inspired my career in public service. And it's easy to see that the same is true for Mr. Williams, who has amassed an impressive record and a wealth of experience. His nomination comes at a critical moment in the history of the organization we both love. For nearly half a century, the Peace Corps has stood as a uniquely American institution. What other great nation would send its youth abroad, not to extend its power, not to intimidate its adversaries, not to kill and be killed, but to build, to dig, to teach, to empower � and to ask nothing in return? The Peace Corps has shaped not just the lives of these young Americans, but the identity of all Americans: who we are as a people, and what we hope to achieve in the world. 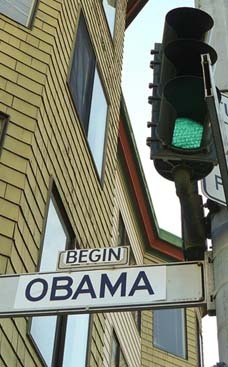 Today, it stands at a crossroads of sorts. The things that have made the Peace Corps such a success story are still true. But there are difficult questions to be asked. How can volunteers be better managed? How can they be better trained? Are we focusing on the right kind of development work? Can we improve recruiting? Are we sending our volunteers to the right countries? Are the goals of the Peace Corps still in line with the goals of our 21st century foreign policy? The answers to these questions matter. That is why I introduced S.1382, the Peace Corps Improvement and Expansion Act of 2009. The Peace Corps, in my view, must grow. Today, the organization is faced with the prospect of having to reduce the number of volunteers when, instead, we should be planning to increase volunteers and expand operations to new countries like Vietnam, Indonesia, Egypt, and Brazil. At the same time, the bigger any organism grows, the slower it gets, and with growth must come reform. That's an uncomfortable subject for those of us who love the Peace Corps. The last thing we want to do is destroy the uniqueness of this institution and the values that make it so special. So the task of enacting these reforms should fall to someone who truly understands the Peace Corps and what it has meant throughout its history. That's why I'm so glad that Mr. Williams has agreed to serve this organization once again. He brings with him wide-ranging experience in the field of international development, including time spent at USAID. And he also brings with him a deep appreciation for the institution. Mr. Williams, we have important work to do, but I am confident that you're up to the job. I look forward to our discussion today, and to partnering with you as we undertake the important task of building a stronger, more effective Peace Corps for the next generation of Americans. Isakson added that he had had the experience of working with Jody Olsen, the acting Director of the Peace Corps, under very difficult circumstances earlier this year after the murder of Peace Corps Volunteer Kate Puzey, a Georgia resident. Isakson said that the Peace Corps responded as well as anyone could have expected under the circumstances and that the family was very appreciative. 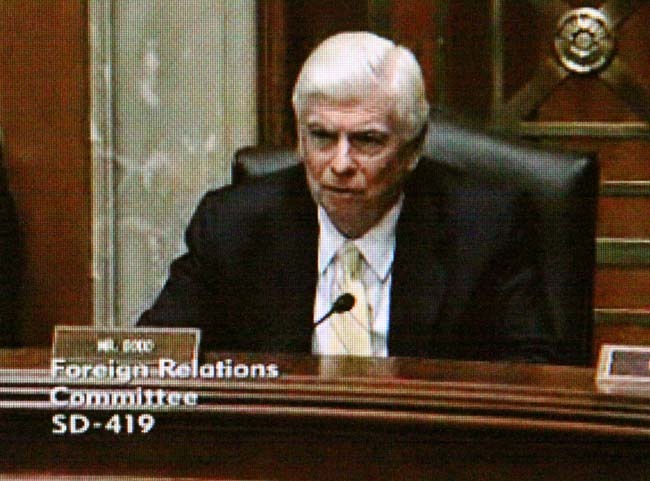 Senator Dodd asked Senator Johnny Isakson of Georgia, the ranking Republican member of committee if he had any remarks and Isakson said that he was honored to be part of the hearings, that Isakson now occupied the Senate seat once held by Paul Coverdell who had been the Director of the Peace Corps under the first President George Bush. Isakson added that he had had the experience of working with Jody Olsen, the acting Director of the Peace Corps, under very difficult circumstances earlier this year after the murder of Peace Corps Volunteer Kate Puzey, a Georgia resident. Isakson said that the Peace Corps responded as well as anyone could have expected under the circumstances and that the family was very appreciative. Isakson added that our volunteers around the world go to very dangerous places and that their protection and security was very important. Isakson said that he had been chairman of the Africa subcommittee and that he considered Africa to be the most important continent in the 21st century and that he was pleased that the Peace Corps had recently returned to Rwanda. Senator Dodd added that while he was serving in the Domincan Republic, John Larson, a good friend of Dodd's, had lost his life in a traffic accident while he was on his way to a baseball game and that Dodd understand how important safety and security are. Dodd welcomed former Senator Harris Wofford to the hearings. Wofford said that now we have a new President who wants to double the Peace Corps and who is moving for a bigger, bolder Peace Corps for the 21st century, and that President Obama has nominated a very worthy successor to Shriver in Aaron Williams. Wofford said to Dodd that Shriver was very proud of your leadership, and that Wofford is certain that Shriver would recognize Aaron Williams as the kind of person who should lead the Peace Corps today. Harris Wofford began his remarks by telling Dodd that Aaron Williams had one thing over Dodd - that Williams had found a willing wife in the Peace Corps. Wofford said that Williams and his wife Rosa, had a son, Stephen, who has just been admitted to the Peace Corps. Wofford told Dodd that the men and women of your generation who were the true pioneers of the peace corps and he remembers well the enthusiastic response of the students at the University of Michigan who when John F Kennedy asked how many would be ready to go to Ghana to serve, put together a scroll of over 1,000 names that they presented Kennedy in Iowa and that that scroll was the impetus for Kennedy to propose the Peace Corps in San Fransisco. Wofford added that Kennedy put the Peace Corps on the fast track which is the same thing that they are doing with the nomination of Aaron Williams to be Director. Wofford remembers that when Shriver took over the Peace Corps, he was in a meeting at the State Department when somebody asked how many years it would take to get the first volunteers on the ground at work and somebody said one and a half years, another said two years, but that Shriver had 600 volunteers working in six countries in six months. Wofford said to look at Williams' record. He has no enemies, he is a developmental professional, he is the first Director have that background. Williams' collegues like working with him andWilliams knows how to build partnerships with all kinds of partners, and that Wofford has come to know and respect Williams. With that introduction Aaron Williams began his opening statement. Williams began by introducing his wife Rosa who he met while serving as a volunteer in the Dominican Republic and his son Stephen who has been accepted into the Peace Corps and added that his only regret was that his mother, Blanche, did not live to see this day, but that he knows she is smiling down on me. "She was the first person in my life who saw the value and importance of serving in the Peace Corps." I would like to acknowledge and thank my family for supporting me and joining me on this journey that has taken us to so many different communities around the world. The love of my life and rock of our family is my wife Rosa, whom I was very fortunate to have met in the Dominican Republic and who has been my partner in serving our country during our many years in the Foreign Service with USAID. I am very pleased that my sons Michael and Steven are here. They are joined by my sister, Hilda Jones, and her daughter Ellen, and my brother Philip Williams. I am thankful they could join us today from our hometown of Chicago. My only regret is that my dear mother, Blanche, did not live to see this day, but I know she is smiling down on me. She was the first person in my life who saw the value and importance of serving in the Peace Corps. Finally, I wish to thank my friends, mentors, and colleagues, many of whom are here today. Many of these individuals are part of this vast Peace Corps family and who have been a source of inspiration for me. The Peace Corps opened the door to another world for me, and what an extraordinary opportunity it was. I returned from the Dominican Republic to my hometown where I became a recruiter and coordinator of minority recruitment for the Peace Corps in the Chicago regional office. If confirmed to be Director of the Peace Corps, it will indeed be a homecoming. I firmly believe in the strength of grassroots organizing and the impact of creating sustainable health, education, and environmental practices one community at a time. I grew up in a modest home on the south side of Chicago never dreaming that one day I would have a career in international development. I served as a Peace Corps Volunteer in the Dominican Republic from 1967-1970, in a teacher training program for rural school teachers, and then at one of the finest universities in the country, Catholica Universidad Madre y Maestra in Santiago. I learned to speak Spanish, and I was able to work side by side with Dominican teachers and students, in their classrooms, in their language. I tried to make a difference in their lives each and every day, and they imparted life lessons I have never forgotten. I finished my Peace Corps service with a new appreciation for the world and embarked on a career in public service firmly rooted in all that I learned in the small town of Monte Plata. As this committee well knows, the individuals who share the experience of Peace Corps service are united by a similar belief in people-to-people exchanges. If confirmed, I am proud that I will represent the nearly 200,000 returned Peace Corps Volunteers. There are old and new challenges. Poverty, disease, famine, and illiteracy are issues that continue to challenge developing countries, and in some cases are exacerbated by current problems like climate change, government instability, and terrorism. The work of Peace Corps Volunteers is not easy, but it is substantial. Living and working in communities around the world for twenty seven months creates hope and a cross-cultural understanding that is incomparable to any other life experience. The issue of Volunteer health, safety, and security must remain an agency priority. There are inherent dangers in serving overseas, but with quality training, a committed staff, and clear systems in place, the health, safety, and security of Peace Corps Volunteers will be assured in a manner that allows enough openness for Volunteers to truly become a part of the community in which they serve. It is important that we always remember the Peace Corps Volunteers who lost their lives while serving this nation and strive to ensure the health and safety of all present and future Volunteers. It is a fundamental responsibility I understand, and I am prepared to take on. It is an honor and a privilege to be considered for a position first held by the legendary Sargent Shriver. If confirmed, I will face many of the challenges that he so ably negotiated to build this agency to its peak of 15,000 volunteers in 1966. Today nearly 7,500 optimistic, dedicated, and courageous Volunteers are serving around the world. The agency runs a global operation that never quits. The staff, both here in the U.S. and those at posts around the world, is dedicated to one thing: supporting the Volunteers. If confirmed to be the next Director of the Peace Corps, I know the relationship the agency has with the Volunteers does not end with their arrival home. This commitment is a fundamental part of advancing the Third Goal in helping to promote the better understanding of other peoples on the part of Americans. The returned Peace Corps Volunteer brings his or her experience into American classrooms and community centers. The returned Peace Corps Volunteer serves in health clinics, leads small businesses and large corporations, and diligently works in development and humanitarian organizations around the world. The Third Goal is a vital commitment for the Peace Corps family. If confirmed, I will foster the united strengths of returned Peace Corps Volunteers to continue contributing their time and energy on projects that benefit communities in the United States. Peace Corps continues to capture the imagination of Americans in record numbers. During the first half of this fiscal year, applications for Peace Corps service have increased by 12 percent over the same period last year. Americans are inspired by President Obama's call to service. Now is an ideal time to look for ways to expand the Peace Corps in a sustainable way. Before concluding my remarks, I would like to acknowledge Peace Corps' return to Rwanda this year. President Paul Kagame has welcomed the program and has graciously referred to Peace Corps Volunteers as his nation's "sons and daughters". This has been an emotionally charged reentry for the agency, but it is also a shining example of what Volunteers do to represent America abroad. And it isn't just the 32 Volunteers that are on the ground; it is their families, friends and the generosity of America they are representing. That is a true vote of confidence in the renewal of Rwanda. If confirmed I want to work closely with this committee and the agency's supporters on Capitol Hill to inspire the next generation of Americans to serve. Peace Corps is a cost effective way for the Unites States to expand its humanitarian presence. I envision a Peace Corps that remains strong for another fifty years, one that grows, adapts, and continues to carry the torch of President Kennedy's dream -- and responds to President Obama's call to service both at home and abroad. Mr. Chairman, Ranking Member, and members of this Committee, thank you for your time and consideration of my nomination. If I am confirmed, I look forward to working with you to make sure that future Peace Corps Volunteers are afforded the same quality experience I had and that communities in this great nation continue to benefit from their service. I would be pleased to answer any questions you might have. Senator Dodd began with a question for Williams. Dodd pointed to a map that he had brought of the countries where the Peace Corps had programs and the countries where Peace Corps had closed programs. Dodd asked how do we manage scarce resources? What are the criteria for determining whether a country should have a program. Does it make sense that the Peace Corps has a program in Vanuatu and Fiji but not in Indonesia or Brazil - is there a reason for that. Dodd said that the Peace Corps only has programs in two muslim countries: Jordan and Morocco. Dodd said that Indonesia, another muslim country has expressed a strong desire for a program and that Libya is expressing an interest as well. But do the criteria for starting programs reflect the global landscape fo the world today? Williams answered that we need to look at the Peace Corps in a new light. That volunteers are wonderful ambassadors of humanitarian assistance and that we need to know more about the countries where volunteers serve. Williams said that he has not had a chance to look at the criteria for selecting countries where the Peace Corps will have programs but that he wants to work with the US State Department and look at all aspects of the country selection process. Williams said that with regard to muslim countries that obviously there is a need to learn more about muslim countries and he wants to expand programs in muslim countries. Williams says he wants to site down with country staff and see where we can re-align. Williams says that there are two ways to expand the Peace Corps - one by expanding existing Peace Corps programs, and two by going into new countries and that he will look at both. Dodd asked about health screening issues and told Williams that when Dodd had come back from the Peace Corps and that he had served in the army and that it only took 5 minutes to get his health screening to join the army. Now we don't expect it to take 5 minutes to get health screening from the Peace Corps but are we dealying too long. Dodd said that it is not uncommon for screening to take weeks or months and with with older Americans, the screening can take even longer. What would Williams do about the process? Senator Dodd said that when Williams came back from the Peace Corps in the Dominican Republic that he had been involved in recruiting efforts and that this is an area of concern that Dodd has. Dodd says that we are closing regional offices and added that we have a Senate number for the Peace Corps budget and a House number and that if we talk about expanding the tendency has been to only talk about young people but that we need to expand the idea of recruiting from the older population. Dodd said that at a time we are shutting down regional recruiting offices, how do we expand the opportunity to serve as a volunteer? Dodd asked about health screening issues and told Williams that when Dodd had come back from the Peace Corps and that he had served in the army and that it only took 5 minutes to get his health screening to join the army. Now we don't expect it to take 5 minutes to get health screening from the Peace Corps but are we delaying too long. Dodd said that it is not uncommon for screening to take weeks or months and with with older Americans, the screening can take even longer. What would Williams do about the process? Williams answered that one of the things he wants to look at is volunteer selection and recruiting and that the Peace Corps needs to learn to do things in a much more efficient way with modern practices. Williams said that recruiters have to represent the Peace Corps in the best possible way and that older people can bring a lot to the table. Williams says that we need to be sure that the Peace Corps represents the face of America and that means we need to recruit at junior colleges and at traditionally black colleges. As far as medical clearance goes, Williams said he also remembers that process and is hoping that he will find out that it has changed so that we don't lose our older applicants. Williams said that the the third goal is one that we need to pay closer attention to and that he wants to engage in a listening tour. Williams said he had been privileged on the Board of Directors of the NPCA for the past couple of years but that he knows that we need to expand our outreach and expand the third goal. 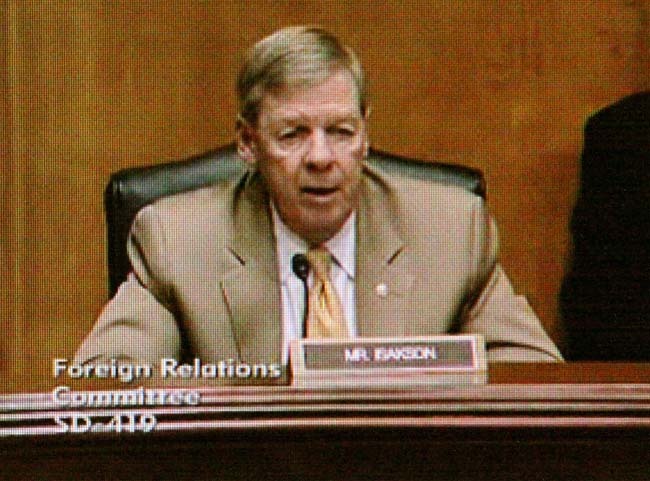 Senator Isakson said that the USAID is a great complement to the Peace Corps then added "Is that the way to say it?" to which Senator Dodd added "It's a sensitive subject." Senator Isakson asked about the Third Goal of the Peace Corps and said that the Peace Corps seemed to have done a pretty good job on the first two goals, but had fallen down on the third goal. Senator Isakson said that there are there are some great stories to tell from around the world about countries that are now friends of the united states and that he would encourage Williams to be an ombudsman to bring about a better understanding of the world here in the United States. Senator Isakson said that it is critically important to know the Peace Corps is absolutely committed to the safety of volunteers and asked for Williams commitment to volunteer safety. Senator Isakson said that he knew that Williams had served for over 20 years in USAID and asked what countries Williams had served in. 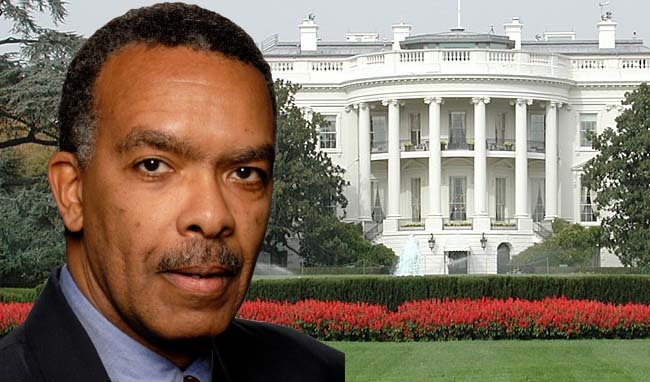 Williams said that he had begun his service in USAID with three years in Honduras, that he had served for five years in Haiti, that he had served in Costa Rica, and been Regional Director for the Caribbean. Williams said that his last overseas assignment had been as USAID Mission Director in South Africa during the Mandela administration. Williams said that he knows that Isakson is a great friend of the Peace Corps and that it is important that the Peace Corps have collegial relationships with all the other agencies including Pepfar (President's Emergency Plan for AIDS Relief), the US State Department and USAID. Senator Dodd asked Williams about the third goal, about empowering Peace Corps volunteers, about using new technologies like the internet and facebook with volunteers, about feeling that volunteers are not being listened to as they should be, and about the methodology used for calculating the percentage of volunteers who take early termination. In all cases, Williams said that he couldn't agree with Dodd more and that he would work with Dodd, and look into each of the issues after he was confirmed as Director. Senator Dodd asked Williams about the third goal, about empowering Peace Corps volunteers, about using new technologies like the internet and facebook with volunteers, about feeling that volunteers are not being listened to as they should be, and about the methodology used for calculating the percentage of volunteers who take early termination. In all cases, Williams said that he couldn't agree with Dodd more and that he would work with Dodd, and look into each of the issues after he was confirmed as Director. 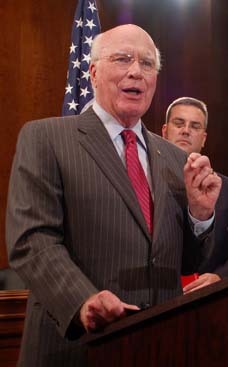 Senator Dodd closed the hearings by asking Williams about his relationship with President Obama. Noting that Williams was born in Chicago he asked if Williams had known Obama there. Williams said that he had actually lived in Chicago before President Obama had arrived on the scene and that Williams' first direct contact with Obama was when he had a chance to brief Obama when he made a trip to South Africa. Senator Dodd said that he hoped to move things along with Williams nomination before the August break and hopefully get him confirmed before everyone disappeared in August. President Obama has nominated Aaron Williams for Peace Corps Director - an RPCV who has spent 40 years working in international development. "It's exciting to have a nominee who served in the Peace Corps and also has experience in international development and management," says Senator Chris Dodd. Our congratulations to Williams and thanks to the President for his excellent choice to lead the Peace Corps. Read our biography of Peace Corps Director Aaron Williams. Thank you so much to PCOL for publishing the Aaron Williams confirmation hearings so quickly. 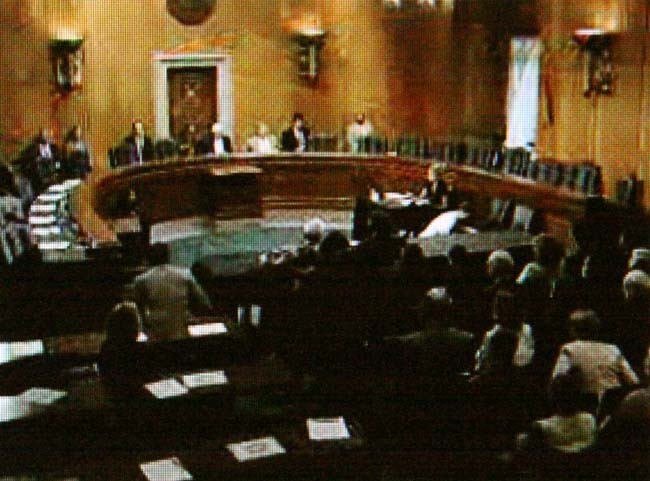 My dial-up connection was not fast enough to get the audio of the hearings, so I watched but could not hear. It was so good to be able to read the transcript right away. All of the efforts of PCOL to keep the Peace Corps community informed and connected are so very much appreciated. My case in Federal Court against Peace Corps proves I was right from the beginning of my case and service with Peace Corps. The Case got dismissed on "Time" and from my point of view, obstruction from Peace Corps on transparancy. As you will see in my court case, the Judge indicates the Peace Corps had violated my rights under the Federal Torts Claims act, the ADA American with Disabilities Act, Rehabilitation Act, and more. I beat the Peace Corps and the US Attorney's office on the merits and I will continue to do so. Me and my family did not have attorney at that time and has not since. I have been fighting for my rights and the cover up of my safety incident in service, since. They have covered it up as best they can. The issues of Safety and getting an office of "Counsel" for Volunteers and getting the careers of RPCV's that went through these safety issues has not ended. We will win against the NPCA, Senator Dodd and others who want to shut us up. It was our service. Not their's.We deserve better, the family of victims deserve better, current volunteers deserve better and the American people deserve better when it comes to doing the right thing by what they advertise for volunteers going into service. We did not volunteer our times to be abused by the government in health care, safety and our civil rights. Our service records should be reviewable on their merits and Peace Corps should give back for the damage they have done to our families and our lives. Next step, Court of Appeals, and if need be the supreme court. I did not volunteer for the Peace Corps for Peace Corps medical services, their nurses and Director's from the late eighties to now to be able to ruin my career. I will be speaking soon about my struggle, my fight on my own without an attorney and all the behind the scences advocacy I have done to have the agency do the right thing. I wll also talk about the indivdiduals who threatened me at my site by name and where they live and why Peace Corps did not investigate my claims of having a safety issue in service. Was the Peace Corps covering up for these individuals? Well, mark my words I will be speaking about who they are. We will see how powerful the bureaucrats who hurt my mother ,who is now seventy, and raised seven children by herself. We shall see how this Director reacts to me speaking about these issues freely, because aren't we a country of the 1st ammendment. You think the Dayton Daily News was a story. You wait. We will have the office of Counsel and our careers will be back on track. By the way, the Peace Corps said my case was a medical issue. Well, if it was a medical issue, why not medical care for the past twenty years. I have certainly come to agency to resolve the matter. Where is the high and almighty Peace Corps with their brillant FECA program? As I said to the Inspector General in the past who chided me about my case. I am stating here I will get justice in my case and you will see Peace Corps former Volunteer issues come to a head as an issue in our country as the cover up of our cases will be revealed. And to all you have served and have issues with my case, my fight, and say move on. No, when someone cheats, tries slight of hand and tries deliberately ruin people for volunteering and giving of themselves. No, you folks get out of our way. Our lives and our Equal Opportunity rights are important too. A Complaint, like it says in Federal Court is a Complaint. If you folks in the bureaucracy are so right, then why hasn't my case been reviewed correctly once. It is a cover up. All my friends know it is and so do many people hear in Massachusetts. My family five sisters and one other brother want Peace in our family. Tom Tighe read my entire file years ago and said we can remove "remove some of non medical material" (the gossip and innuendo) and their would be no case against you. He recused himself from case after that. The PC continued to violate my rights with gossip and rubbish talk prevailing over truth of a safety incident. Tom Tighe became Deputy Director of Peace Corps and now runs a huge company. Was he wrong?